Back, way back, in ye olde nineteen and eighties, my snaggle-toothed little brother and I would go stay with my dad at his swinging bachelor pad on the weekends. It was a modest home, furnished with wicker barrel chairs and those weird fake feathered plumes that inexplicably still pop up in homes of the design challenged across America, but it was redeemed by two wonderful things: bunk beds, and the most kickin' jungle themed mural wallpaper you have ever seen. I remember having the best conversations with my brother and dad set against the backdrop of that wonderful mural... Dad: If you could meet anyone, anyone, who would it be? Eight-year-old Me: Michael Jackson! Michael Jackson! Thankfully, some things have changed, but I still want that wallpaper. To assuage the bittersweet pinprick pain of my nostalgia, today's post is bringing back the retro photo mural. Michael Jackson thankfully not included. Although not junglerrific, my dad would certainly approve of this wildlife encrusted mural from Cabela's -- one of his favorite stores. At $80, it's kind of an amazing bargain, and it doesn't scream banjos and rifles as long as the furnishings and accessories are kept clean and simple. 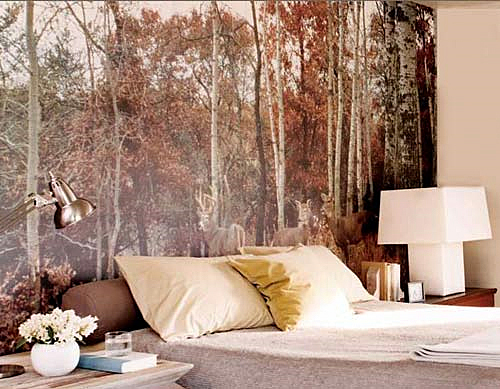 These homes featured in Apartment Therapy follow suit with a woodsy atmosphere. 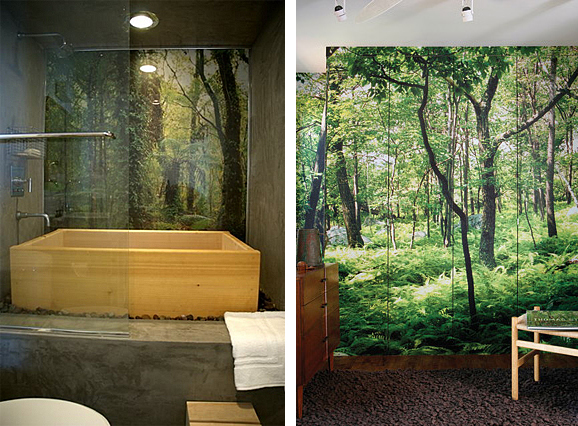 The panels on the right are disguising a closet, which is pretty freaking genius, if you ask me. The quirky home of Shauna Alterio & Stephen Loidolt, owners of small business Something's Hiding in Here, outfitted their loft with tons of whimsical details, not the least of which is this virtual forest in the kitchen. If you haven't seen the rest of their home, check it out here at Design Sponge. It's pretty inspiring! 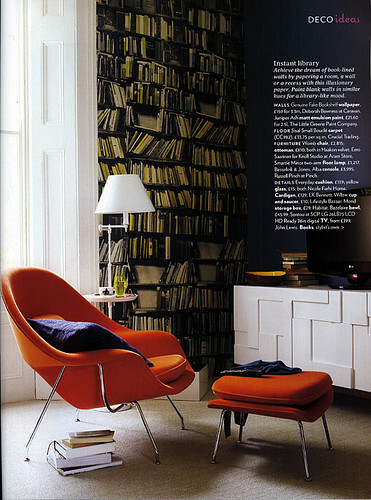 Sorry about the tiny pictures, but I just had to show this room designed by superheroes Wary Meyers, which I think uses the exact same wallpaper! 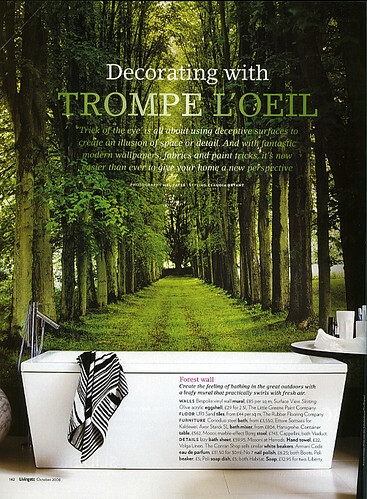 Please Sir featured this incredible image on her blog, and I've been mildly obsessed ever since. 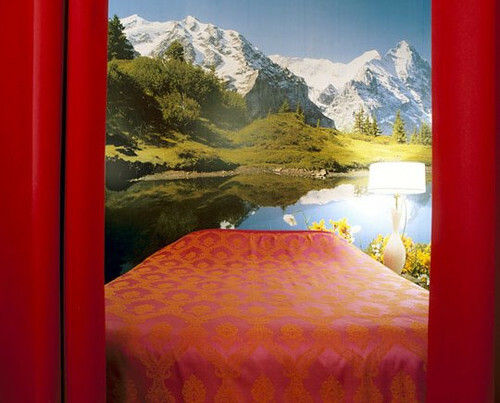 I LOVE the theatrical red curtains, which make the mural look like a painted backdrop, and the coverlet is bold without overpowering the space. Photograph by Annie Schlecter. 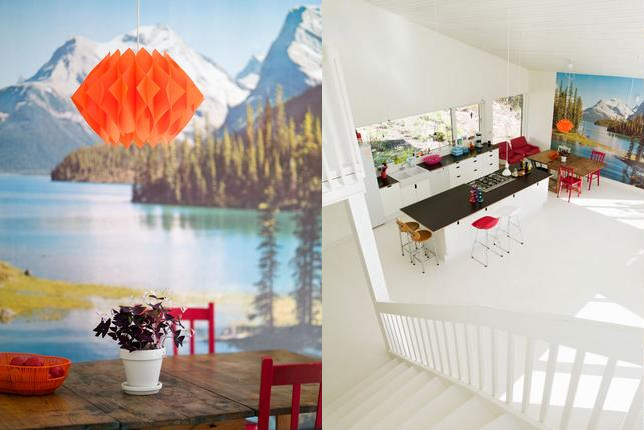 There's a similar sense of icy optimism in these images shot at a Swedish home by Per Ranung. Those crazy bursts of color look fabulous amid the acres of white. They have a zillion (gorgeous, tow-headed) kids, though, so don't ask me how they keep that place clean! 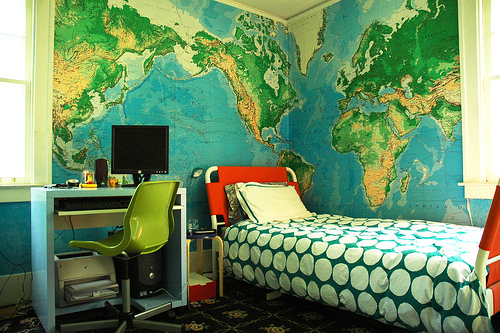 I blogged about this rad kid's room decorated by Flickr user kbreenbo eons ago, but it's awesomeness bears repeating. That child is going to grow up knowing where Qatar and Easter Island are, and that's more than I know, already. Want to look book smart without actually reading? Living Etc shows you how it's done. No dusting or alphabetizing required. (And it would be helpful if the furniture were also included). 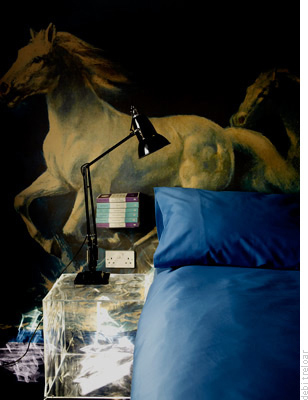 Karly blogged about this gorgeous room in Studio Ilse's portfolio a couple of weeks ago, so hopefully you won't hate me for recycling, but who doesn't want to dream of wild, wild horses? 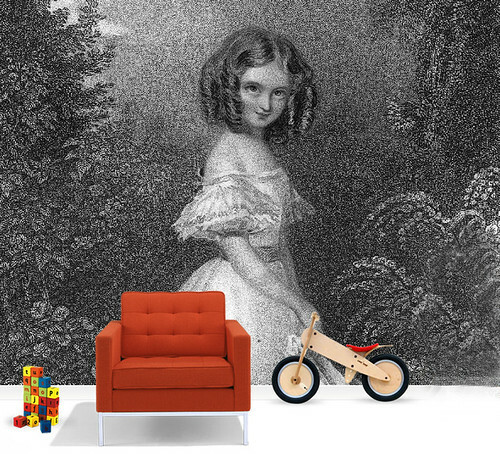 Wouldn't this be a charming girl's room if paired with some really sleek, colorful furniture and accessories? Oh, and I made these, too... Sorry about the dingy pop-ups in the corner. I linked it to the full size version in case you want to scrutinize the pictures, but I am sure you can tell that there is a wide variety of selections available, some of which I covet. Badly. Unfortunately, as expected Surface View's murals aren't exactly cheap. Shipping alone is $150, and the price per square yard is $160. Ouch. Meanwhile, murals available through Cabela's, Target and the Mural Superstore (super cheap!) are in the $80 - $200 range. 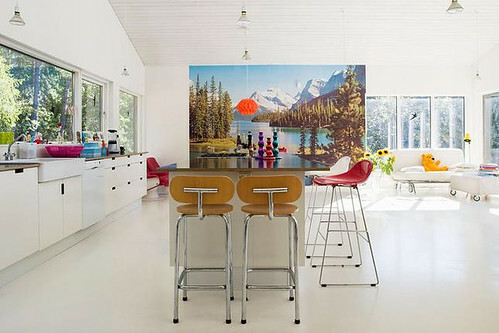 Of course, if you want something totally custom, you could have your own image blown up into a mural sized panorama (provided it's not a copyrighted image) through Design Your Wall. So what do you think? 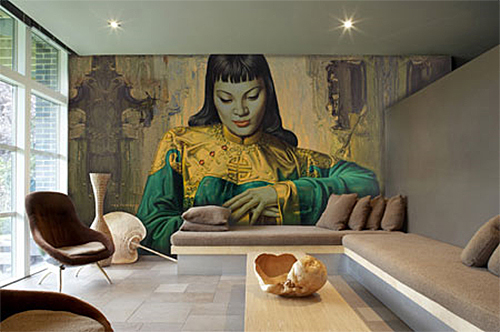 Do these murals leave you with a lovin' feeling, or does the purist in you revile the very idea? Tell me all about it.